Generally non-citizens may not work within The Bahamas. There are exceptions for those having skills not available from a Bahamian. The employer must show proof of exhaustive searching for a suitable Bahamian prior to applying for a work permit for the foreign candidate. Now there are many instances wherein the requirements are prerequisites determined by the employer based upon the candidate they have in mind already. To say it simply, if someone wants you to work down here they will write the classified help wanted ad to demonstrate that only YOU could possibly fill the position. Many Bahamians having received higher education from Universities in foreign nations, seek higher paid positions in other countries rather than their own. However any ordinary position not requiring specialized skills will not readily qualify as an employment opportunity for a foreigner. For instance should a foreign national apply for a position as a maid they most certainly would be denied the application. There are no specialized skills, experience or higher education required to perform the associated duties and therefore many suitable candidates of Bahamian origin can be obtained from local advertising of the offered position. The lack of four (4) year colleges (and beyond) within The Commonwealth of The Bahamas renders many citizens unable to obtain the furtherance in education necessary to fill positions mandating Bachelors and Masters degrees. The citizens who can afford to go abroad to further their education or those that receive scholarships are the minority of the overall population. There are also privileged areas of employment wherein only nationals may fill the positions with few, if any, exceptions. The normal exceptions will be those that allow for educating Bahamians to the job skills associated with the position. Once a qualified replacement has been trained they should then take on the duty of further educating the population needed to surmount the demand in the job market. Another particular that has changed over the past recent years is that it is now the responsibility of the employer to sponsor the work permit of the non-Bahamian applicant. Moreover the applicant may not be on Bahamian soil at time of submission of application for employment. In years past a foreigner might make application on his own for a work permit in a specific field and then seek a position. No longer is this allowed. The employer must first demonstrate that it has failed to yield a local Bahamian applicant despite all reasonable efforts. Therefore foreigners may not make a general application to the government for a work permit should he/she be unsponsored by an employer for a particular position. Work permits can be costly and are assessed based on the value of skills. The field of teaching is an area of need and many teachers enter on work permits. The employers are not likely to readily contract with unnecessary foreigners as a work force as they must post a bond ensuring that the expenses of removing the non-Bahamian from the country are covered as well as any incidental damages the employee might incur indebting himself to the government for items such as medical care. The bond will need to be adequate to cover the employee's dependents as well. There is good cause to mandate a bond. Should an expatriate become seriously ill as a working resident he or she might become a burden to the government and detour resources from the citizens who are rightfully in need of such services. Therefore the employer should be bound to provide sufficient medical insurance benefits. Should the expatriate not have the moneys to move off of Commonwealth islands following termination of either work permit or employment he or she might further deplete the resources rightfully due the citizens. Residency without the right to work may be gained both annually and permanently with an adequate real estate investment. An investment in real property is necessary to be considered for annual residency and investments for permanent residency. To obtain an annual residency card you must make application to The Bahamas Immigration, you will need to present evidence of financial independence (hence you do not need to produce an income to survive - mandatory); be prepared to submit signed letters from your local Bahamian bank of your average amount of deposits on hand, you must present proof of good and upstanding character. This can be presented in form of personal recommendations from judges, politicians, government officials as well as clergy and charity organization leaders who know you and can make a positive declaration on your behalf. You will also need to submit a police certificate evidencing that you have a clean criminal or arrest record and are considered an upstanding citizen in your local community (your local law enforcement department will understand the nature of your request when you present it to them) You will need to submit two passport photos with your application and a $25 fee for processing (non-refundable). You will be interviewed and if meeting acceptance upon approval you will need to pay $500 for annual residence, which can include your spouse and dependents. You will not be granted residency under these circumstances unless you are a homeowner or investor or spouse of a citizen. Permanent Residency requires much of the same but furthers the financial information required to speak for itself that not now or in the foreseeable future would you require a position to receive income to continue your residency here. Why all the red tape? The Bahamas Immigration policy protects Bahamian jobs and ensures that Bahamians are considered first and foremost for all positions. It is not intended to deter foreigners however it is a policy that does not make it easy to gain employment in the Commonwealth. Of serious concern are the large numbers of immigrants arriving from Haiti and Cuba. The US does admit many seeking asylum but has a screening process and certain criteria that must be met. The Bahamas is not as well equipped to deal with this crisis and moreover the workforce these folks bring forth is in direct competition with Bahamians. 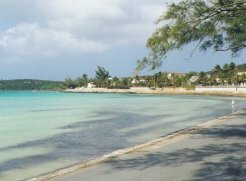 Spousal permits are possible to those married to a Bahamian. The first lasts for 5 years and 6 months prior to its expiration the spouse must apply for permanent residency and/or citizenship.